At ISE 2014, Attero Tech will unveil its new unIFY series control modules. 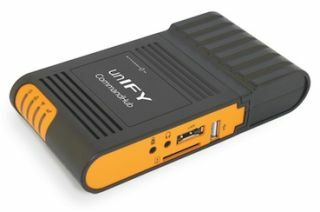 The new products include the CommandHub for third-party devices and RemoteHub for the AT DialogBox. "Our goal with unIFY is to offer customers a more complete networked AV solution that's affordable, flexible and highly capable," said Mike Sims, director of marketing and sales. "These products will expand our customer's options significantly." CommandHub enables third-party devices to communicate with and control the company's Dante and Cobranet-equipped products. It can also be used to bridge separate control and audio networks. CommandHub has an embedded web server for configuration. Required setup, however, is minimal. Attero Tech will publish its control protocol for its products that third-party, control-systems programmers can use in conjunction with the CommandHub to control and monitor AT devices. RemoteHub will interface with simple, low cost wall-mounted remotes. Examples include a volume remote, a preset recall remote, and a source selection remote. Installers will be able to assign the remotes to Attero Tech's DialogBox for simple-yet-customizable integration within the local control center software.